All Teacher Editions (TE) are reproducible. The TE contains an answer key, an answer key by category, and the Item Analysis section that can be used as a re-teach after the Benchmark. Student Editions (SE) are sold as consumables with a minimum order of 10 books. The SE contains the two benchmarks, four category tests, answer forms, and a STAAR Chart for progress monitoring. 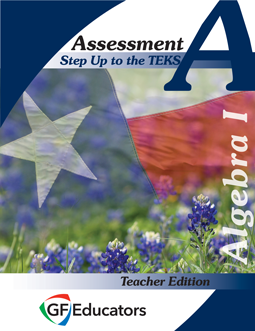 View a Sample of the Algebra I Assessment Teacher Edition by sending an email to info@stepupteks.com asking for the password. Accompanies the Algebra I Assessment Student Edition.